Zhang, H., Zhang, Y., Kong, Z., Yang, Z., Li, Y. and Tarasov, P.E. 2015. Late Holocene climate change and anthropogenic activities in north Xinjiang: Evidence from a peatland archive, the Caotanhu wetland. The Holocene 25: 323-332. Using multi-proxy records -- including data on pollen, charcoal, phytoliths, total nitrogen, total organic carbon and loss-on-ignition from a 268-cm-long sediment core extracted from the Caotanhu wetlands of Xinjiang, China, in August of 2007 -- Zhang et al. (2015) reconstructed a temperature history stretching some four millennia back in time, as indicated by radiocarbon dating of sequential segments of the sediment profile. And what did they thereby find? The six scientists report that one of what they call the "significant climate events during this period" was the Medieval Warm Period, which held sway from approximately AD 700-1200, and which they say "was also revealed at some other sites in Xinjiang," citing Zhang et al. (2009), as well as Nakai (1972) and Wang and Ji (1995), who had identified "a moderate climate around 700 a BP," which was close to the time of peak temperature in their own reconstruction, which was about 1.3°C higher than what had been the case at any other time over the past 3,000 years (see figure below). Reconstructed annual temperature of Xinjiang, China. Adapted from Zhang et al. (2015). In addition, it is worth remembering that at the time of the peak temperature implied by the data of Zhang et al. 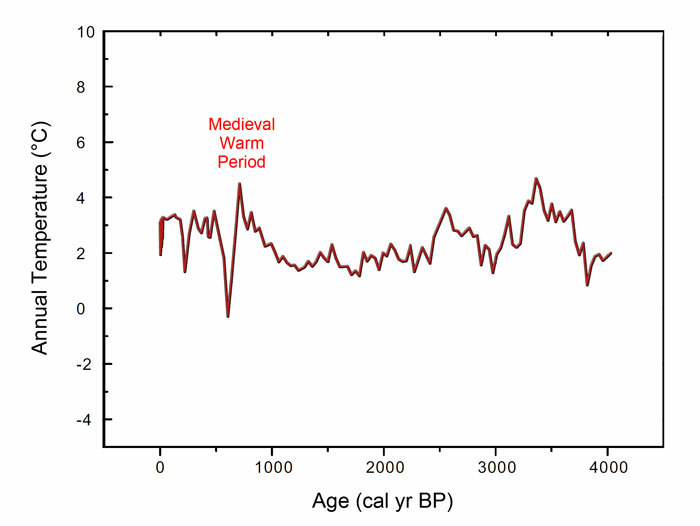 (2015), the atmosphere's CO2 concentration was only about 280 ppm, whereas that of today is approximately 400 ppm, which is over 40% greater than it was back in the days of the Medieval Warm Period, when it was significantly warmer than it is today (see our Medieval Warm Period Project), which facts clearly demonstrate that none of the level of warmth currently being experienced by the Earth need be attributed to any of the CO2 released to the atmosphere since the dawning of the industrial era. Nakai, N. 1972. Carbon isotopic variation and paleoclimate of sediments from Lake Biwa. Proceedings of the Japan Academy 48: 516-521. Wang, S.M. and Ji, L. 1995. Hulun Lake: Ancient Lake Study. Science Press, Beijing, pp. 70-86. Zhang, Y., Kong, Z.C., Yan, S., Yang, Z.J. and Ni, J. 2009. 'Medieval Warm Period' on the northern slope of central Tianshan Mountains, Xinjiang, NW China. Geophysical Research Letters 36: 10.1029/2009GL037375.